If you’ve ever made grilled pork chops and had them turn out dry and tough, you’re not alone. However, deliciously tender, juicy chops are a cinch to make provided you have the right cut of pork and an hour or so to bathe them in a super-simple brine. 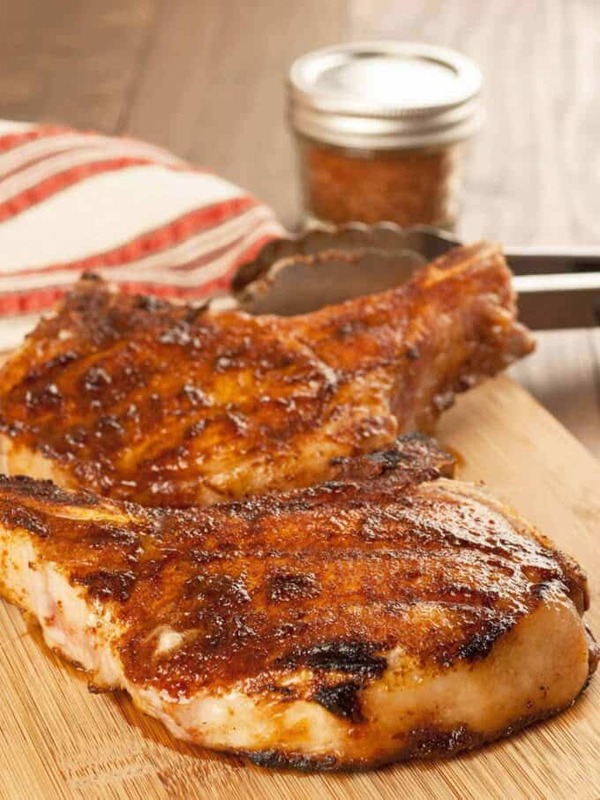 We opted to add a coating of Smoky BBQ Rub to our chops just before grilling, but feel free to go without because the brining makes the pork plenty flavorful on its own. 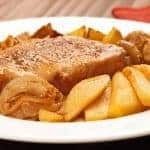 Deliciously tender and juicy pork chops from the grill are easy to make when you choose the right cut of pork and prep with a 1-hour brine. Make the brine by combining 2 cups of water with the salt and sugar in a small saucepan over medium-high heat. Stir until all the salt and sugar has dissolved, then remove from the heat and stir in 2 cups of cold water along with the garlic. Set aside. Once the brine has cooled completely, pour it into a large, heavy-duty zip-top bag and add the pork chops. Remove as much air as possible and seal tightly. Refrigerate the chops for 1 hour, turning the bag over after 30 minutes to ensure even brining. Remove the chops from the brine and pat them dry on both sides with paper towels. Discard the brine. 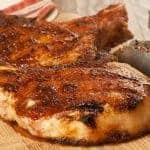 If desired, sprinkle about 1 teaspoon of the Smoky BBQ Rub on each side of the chops and rub it into the meat with the back of a spoon. Alternately, you can rub them with a little olive oil and season with a pinch of salt and some freshly ground black pepper. Because of the salt in the brine you’ll want to be sure to go easy when seasoning the outside of the meat. Oil the grill grates and add the chops. Grill for 4 minutes on the first side, turn and continue grilling until cooked through, 3 to 4 minutes additional. Note: You can check for doneness with an instant-read thermometer and remove the chops from the grill when they reach 135 to 140°F (for medium). The best chops to purchase for grilling are bone-in rib chops. Choose chops between 3/4 and 1-inch thick with nice marbling. Resist the urge to trim them as the rim of fat around the outside adds extra moisture and flavor. If you can’t get bone-in rib chops, the next best choice would be bone-in center-cut chops. 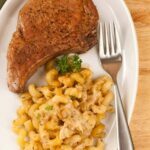 These chops are tender and flavorful, but generally have less marbling than rib chops and consequently are not quite as juicy. 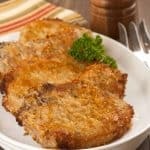 I left them in the brine overnight and they were the best darn chops I have ever had!! 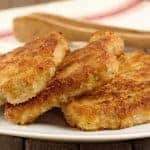 I used a Tupperware container instead of a plastic bag but it was awesome, they were so juicy and some wonderful thick pork chops we got at our local farmer’s market but these are the recipe we used for the chops we bought and this recipe really did them justice!! Thanks for taking the time to comment. I’m so glad to hear the brine worked out on your pork chops. It’s pretty versatile too. We’ve used it for grilled pork tenderloin, turkey tenderloins and boneless chicken breasts too (shorter brining time on the boneless meats though). Never used BRINE until I tried your recipe. I really feel it helps as our lean pork can also be dry when grilled. I followed the recipe and was very pleased. Thank you ! Brining really does help to keep grilled pork and chicken moist and tender. I try to keep some on hand in the fridge during grilling season. Don’t have access to a grill…could broil? Or grill pan? 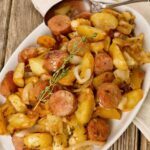 Yes, you can certainly make these in the broiler or grill pan. If you decide to broil, get chops that are on the thicker side and broil them on a rack set over a pan with about 1/4-inch of water in it. Place the oven rack about 5 inches below the broiler too – those steps should help prevent smoking. 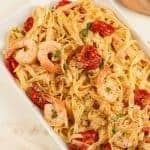 As far as time is concerned, you may need to cook a little longer than the recipe calls for. It all depends on your broiler. Hope this helps. 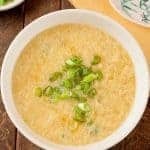 This was a super recipe. I used an Applewood Rub instead of the smokey bbq rub. I followed the rest of the recipe with that one exception. The meat was tender with a little kick. I cooked fresh kale and amish macaroni salad. Dinner was great. Enjoy! 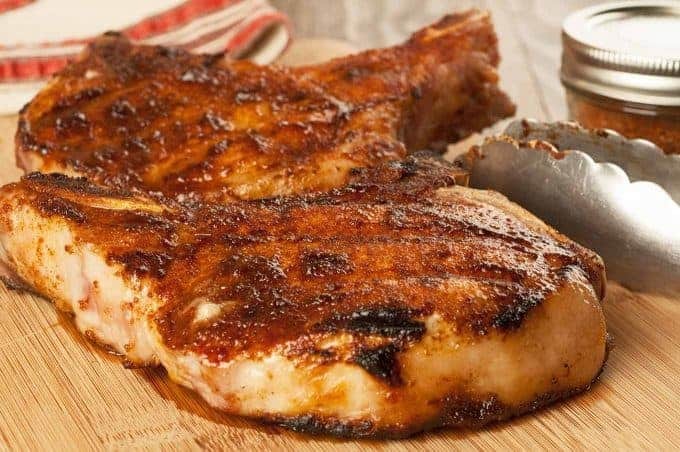 The applewood rub sounds great – so glad you enjoyed the chops!